1. 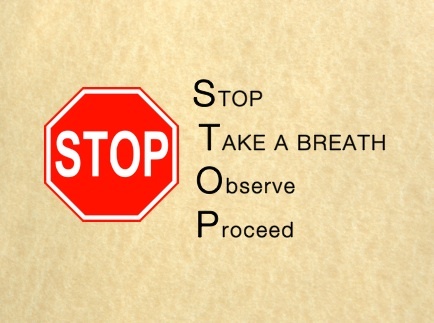 'Stop' means intending to do the STOP practice, and taking a split second from your current thoughts or activities. 2. 'Take a Breath' means turning your attention to the breath, and finding it wherever it is most noticeable in your body. It could be in the belly, or the chest, or the nose... Become aware of the breath as it comes in, and as it leaves the body. You are not trying to change the breath, you are just following it. One or two breaths usually suffice to make that essential connection back to yourself. 3. 'Observe' means paying attention to your present moment experience. What is happening in your heart? In your body? In your mind? In your environment? You get a chance to check in with yourself in a very immediate, and simple fashion, and to find out which stimulus is most predominant and grasping your attention. It may be pleasant, or unpleasant, or neutral. No need to judge, only notice what's going on right now. 4. 'Proceed' means resuming your normal activity with the newly acquired knowledge from your moment of mindfulness. Maybe you found irritation you did not know was there, and you can decide to not let it spill over into your work interactions. Or you are a caregiver, and you finally noticed the background noise from the TV and its potentially stressful effect on the person in your care. You turn off the TV. Or you came across tension in your shoulders, and you get a chance to soften the tightness. 'Proceed' allows you to re-adjust what might have gotten out of balance, both internally and externally. As pointed in an earlier post, it is most helpful to anchor your STOP practice into an existing habit. Best is a habit you engage in often throughout the day, e.g. washing your hands, going to the bathroom, checking emails, getting on the phone, getting up, sitting down, etc. The idea is for you to practice STOP each time after engaging in your chosen habit. For instance, after grabbing my phone to check messages, I stop and go through the whole STOP sequence, then resume and tap the green icon. I recommend you place visual reminders in strategic places tied to your existing habit. It is easy placing STOP signs above your desk, or in the bathroom right next to the towel holder, or in the elevator at work. The STOP sign can also be used as wallpaper on your computer or your phone. When it comes to mindfulness practice, we all need multiple reinforcers! For more by Marguerite Manteau-Rao, click here.